Carbohydrates, fat, and protein are all macronutrients that provide us with energy (calories). Carbs and protein both provide us with four calories of energy per gram, while fat provides us with nine calories per gram. From a ketosis and keto diet perspective, each macronutrient impacts our ability to increase ketone levels in different ways. Fats, for example, are 90% ketogenic and 10% anti-ketogenic, due to the small amount of glucose that is released in the conversion of triglycerides. Proteins are typically ranked at 46% ketogenic and 54% anti-ketogenic since insulin levels rise after eating certain amino acids. Carbohydrates are, of course, 100% anti-ketogenic because they raise both blood glucose and insulin levels, which increases sugar burning and shuts down fat burning and ketone production. This is basically all you need to know to understand why you must eat a high fat, moderate protein, and very low carb diet to follow keto correctly, but why not eat as much fat as possible? After all, fat is only 10% anti-ketogenic, and if the goal is to get into a deep ketosis for its hunger suppressing and health improving benefits, then we should eat as little protein and carbs as possible, right? Sedentary: 0.8g of protein per pound of lean body mass. Lightly Active: 0.8 – 1.0g of protein per pound of lean body mass. Highly Active: 1.0 – 1.2g of protein per pound of lean body mass. Carbs, however, are not essential for health like protein and fat. With the help of a metabolic process in the liver called gluconeogenesis, we are able to meet all of our sugar requirements by making glucose from glycerol (found in fats) and gluconeogenic amino acids (found in proteins). This is why many people are able to take their carb consumption below 30 grams per day while feeling better than they’ve ever felt before. Restrict your net carb intake to between 20-30 grams (the net carb content of any food can be found by subtracting grams of fiber from the grams of total carbs). Eat the right amount of protein for your activity level and body composition goals. Use fat as a lever to help you maintain weight (by eating maintenance calories), gain weight (by being in a calorie surplus), or lose weight (by being in a calorie deficit). 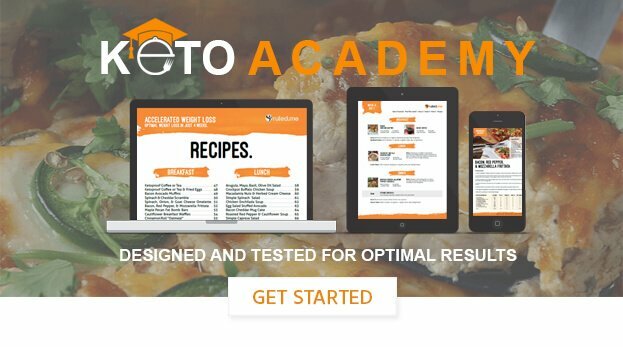 To find out precisely what your carb, fat, and protein requirements are while you are on the keto diet, use our keto calculator. If you’d like to dig a bit deeper into macronutrients, click here.